We are going to discuss a new concept called Accommodating Resistance, and hopefully begin introducing this style of strength training into our programming. 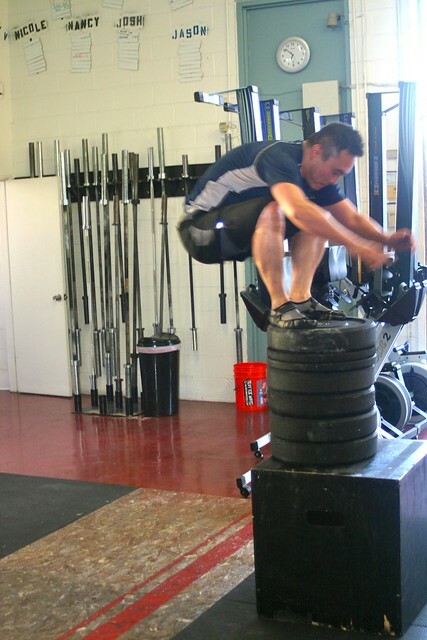 Maybe you have seen people lift with chains or rubber bands attached to their bar, maybe not. The question is what do you get out if? I made the video above as a quick intro and demonstration for how it works with a bench press, but it also works with deadlifts, squats and many other movements! Think about what happens when you perform a heavy lift, lets say a squat. As you perform the movement to a full range of motion, the hardest part for most people will be to get out of the bottom, but as you near the top, the movement is relatively easy. The idea that you can quarter squat a hell of a lot more weight than you can a full squat. Because of the velocity of the movement and different joint angles, certain points of the movement will be more difficult, ie the bottom of the squat. Accommodating Resistance is about strengthening the entire movement instead of a single point. This technique has proven to be one of the most effective ways to increase your overall strength and power. There is a lot more information on the topic, but I’ll leave you with that for today. We will be playing with these movements and beginning to implement bands and chains more regularly moving forward. Tak goes for it! What could possibly go wrong?